Hi everyone, you can swap your jigsaw piece, do trade each other in this post by commenting. Jigsaw event soon to end, quickly trade your jigsaw piece! Duration: Starts with server update. Lasts a week. What does “Rest Time of Redeem” mean? Does mean that the redeeming of prize is until 3 days and 17 hours? hey have you resolve this? i have extra bottom-right and middle-right. 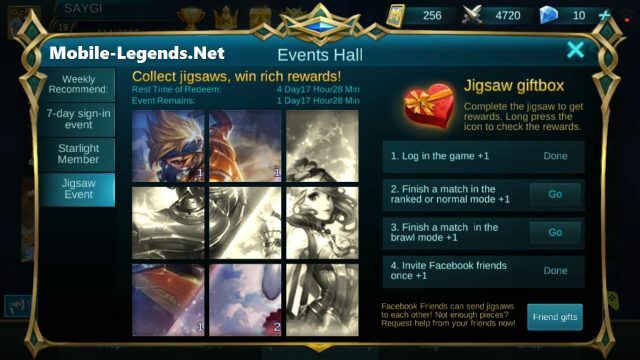 Please fix the jigsaw distribution list. Friend list from my FB some of them are not available on the jigsaw list. Even after i hit Sync FB friends. This also happen after i add a friend trough FB they will not appear on my jigsaw list.